A report in TIME said that Thich Nhat Hanh had stopped receiving medication or going outside. 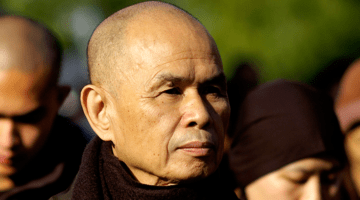 Thich Nhat Hanh in Vietnam in October. 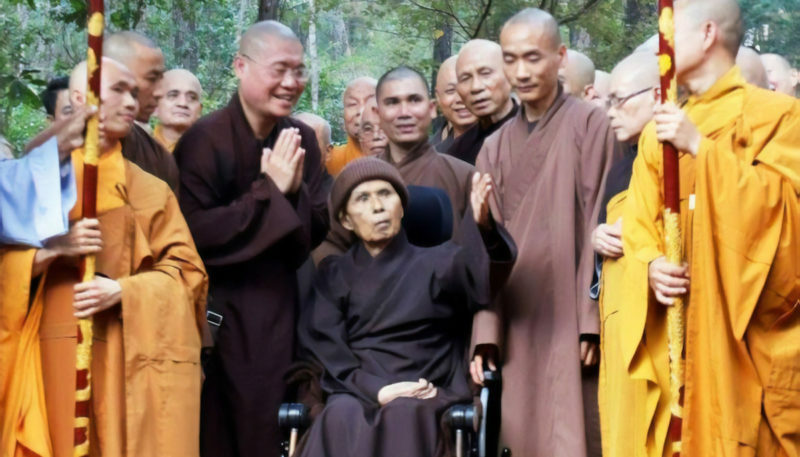 Thich Nhat Hanh’s health is “remarkably stable,” a representative from Plum Village tells LionsRoar.com. The 92-year-old beloved Buddhist teacher is receiving Eastern treatment and acupuncture and regularly goes out for strolls around the temple grounds in his wheelchair. The statements from Plum Village contradict a report published in TIME magazine this week, by Liam Fitzpatrick, based on a trip Fitzpatrick made to Thich Nhat Hanh’s temple six weeks ago. 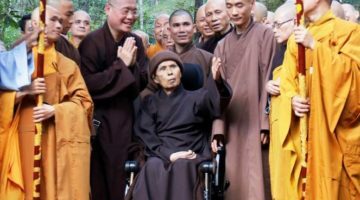 Fitzpatrick wrote that, when he visited, Thich Nhat Hanh “looked as though he could breathe his last at any moment.” He also reported that Thich Nhat Hanh had refused medication and stopped leaving his dwelling in part due to poor health. Thich Nhat Hanh suffered a stroke in November 2014, from which he never fully recovered. Three months ago, he returned to his home country of Vietnam to “live his remaining days” at the temple where he trained as a youth. Thich Nhat Hanh is one of the most famous Buddhist teachers in the world and is credited with helping to popularize mindfulness in the West. Known for his anti-war activism, in 1967, he was nominated for the Nobel Peace Prize by his friend Martin Luther King, Jr. He is the founder of the Plum Village Tradition of Buddhism, which has centers around the world.